No 2 Whitethorn Place is an amazing five bed semidetached property that has been extended, modernised, and totally refurbished to the highest possible standard, resulting in a family home in turnkey condition. 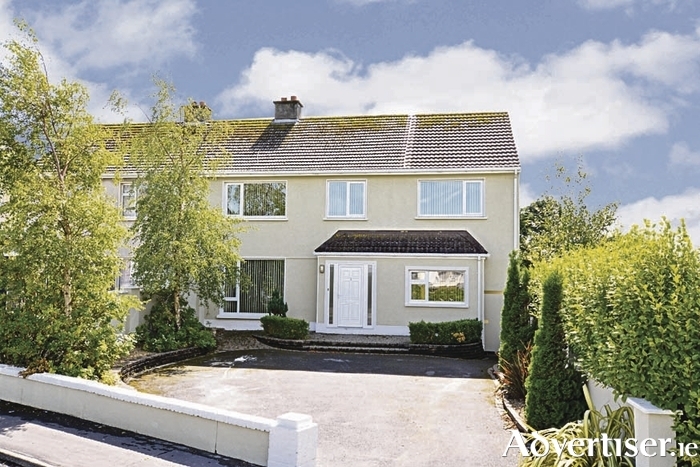 Anne Harding of O’Donnellan & Joyce commented: “It enjoys lovely views of Galway Bay from the rear and offers off street parking for several cars to the front.” Because of where it is situated at the beginning of the road, the garden is large and extends somewhat around the side. This property must be viewed to be fully appreciated. Accommodation includes entrance hall with solid walnut floor and recessed lighting, a guest wc, living room with large window overlooking the front of the house, solid walnut flooring, a feature fireplace, and a door leading to the kitchen/dining room. This large room has a solid fuel fireplace with a stove on a raised tiled plinth and an abundance of cream fitted units, large kitchen island, and all with walnut worktops. The kitchen floor is fully tiled and the worktops have tiled splashback. A large kitchen window overlooks the rear garden and there is plenty of natural light streaming from two Velux roof windows. Fully glazed French doors open to the rear patio and garden, a real suntrap, and a great spot for al fresco dining. The utility room is just off the kitchen and has a door and window overlooking the rear, a Velux window, and quality fitted cream units with walnut worktop. The rear hall has a tiled floor, a radiator, and accommodates the solar heating system. The first of the bedrooms is on the ground floor; this room is double in size and comes with walnut flooring and a fully tiled shower room en suite. An open staircase leads to the first floor landing with superior quality fitted carpet with another four bedrooms. The master bedroom has views over Galway Bay and is fitted with superior quality carpet and walk-in wardrobe. Its en suite has a tiled shower, wc, whb, and tiled floor, and the remaining three double bedrooms are all fitted with quality carpets. Finally, the main bathroom completes the accommodation and comes fully tiled with large corner shower, wc, whb, and bath with shower, and access to the attic. Full details are on www.odonnjoyce.com or contact the sales agent Anne Harding at O’Donnellan & Joyce 091 564212, email [email protected].